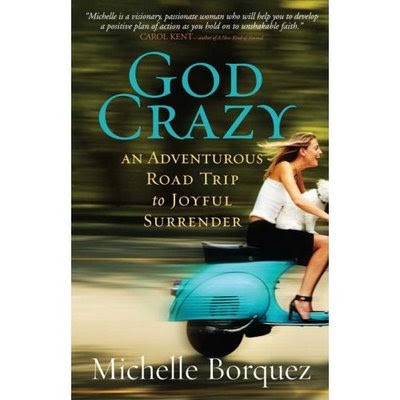 I am reading the book "God Crazy" by Michelle Borquez, and I love it. It's really helping me quench the dryness I've been feeling in my spiritual life lately. With every chapter I read I can feel myself being pulled closer and closer to God. I highly recommend it to any woman looking for something to rejuvenate her relationship with Him. The other night I read a prayer in the book that I absolutely loved, and I instantly wanted to share it on my blog. Sadly, I couldn't get an internet connection at all that night. I was so frustrated! Lord, do not allow me to seek perfection; instead, help me to yield myself to brokenness so that I might be perfected in You. When I forget that it's in Your power that I become clean and restored to wholeness, remind me. Lead me back to Your heart when I want to run off and do things my own way. Lord, help me to discover the ways I have hidden my brokenness even from myself. Give me the strength to sit with that realization and to seek Your mercy and guidance. Turn my longings for human approval into longings for Your grace and Your complete love. In Jesus' name. Amen. Now go back and reread the prayer again. Don't sigh, don't flip to another blog...just reread it one more time. And this time, I want you to consider every word. Don't skim over any...ponder and digest every single one. You'll be amazed how the prayer will speak to you. That short little paragraph speaks volumes about our lives and our need for God. At least it did for me. If you'd like to read a chapter excerpt from the book, check it out on Michelle's site here. I really appreciate your posting that prayer - I need reminders like that. Sounds like a good book, I might have to read it!